Tonight is HALLOWEEN and we’re getting all set up here for the big night. Our neighborhood attracts lots of little ghouls, by which I mean almost 200 trick-or-treaters. It’s kind of an occasion and we love to make special snacks and drinks. After all, there needs to be something besides candy, right? 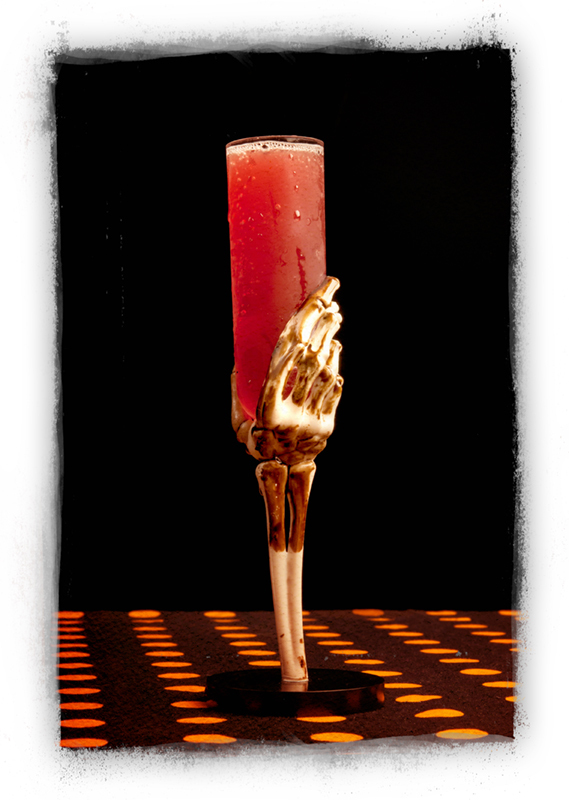 Below, we invite you to join us and try Pumpkin Hummus, the Pom Positive shot, the Blood-Thirsty Werewolf cocktail, Coffin Crunchers and Vampire Apple Bites. After Halloween, check out our idea to upcycle your leftover broken decor pieces and used spooky cobwebs into fresh wreaths for next Halloween. Enjoy – and HAPPY HAUNTING! This simple recipe comes together in about three minutes! 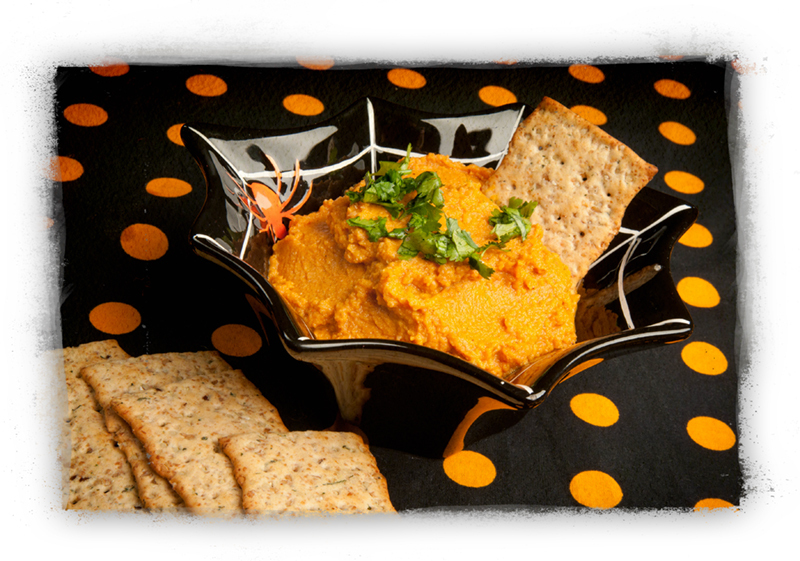 Just add crackers for instant Halloween snacking. Add garlic and fresh rosemary to a food processor or high speed blender with lemon juice. Process until garlic and rosemary are finely minced. Add pumpkin, rinsed/drained chickpeas, paprika, white pepper, cumin, nutmeg, cayenne and salt. Pulse until all ingredients form a smooth dip. Serve immediately or chill. Garnish with a sprinkling of chopped fresh parsley and serve with crackers or fresh veggies for dipping. Also makes a yummy spread for sandwiches and wraps. Yes, this drink asks for some special ingredients but we promise, they’re worth the effort. The William Wolf Pecan Bourbon is incredible! Many major grocery chains carry San Pellirgino and to find the specific spirits, be sure to check their websites for retailers. 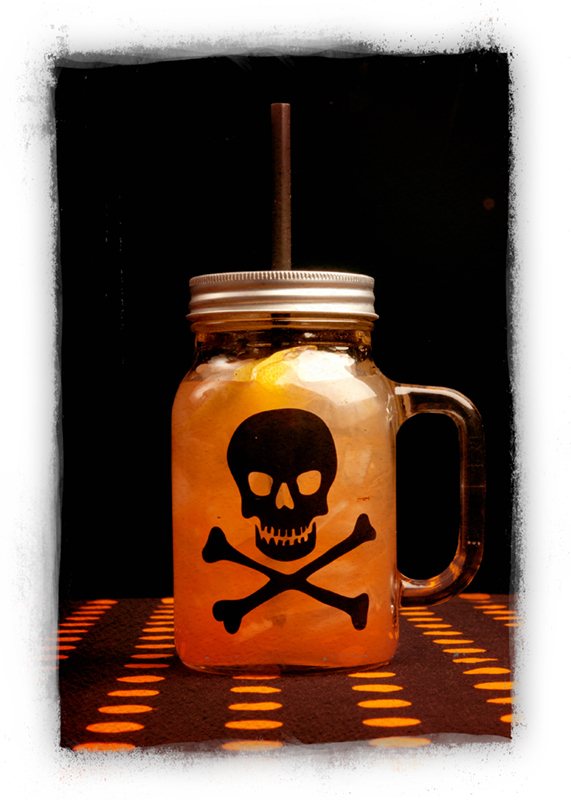 Combine bourbon, ginger liqueor, club soda and blood orange soda in a glass. Stir and pour into a second glass full of ice. Serve immediately with a sliver of lemon. This shot-style drink is bright and refreshing. It goes down very smoothly, so beware! Combine all ingredients in a shaker over ice. Shake and pour into a shot glass. Need a spooky activity for your little gobins? 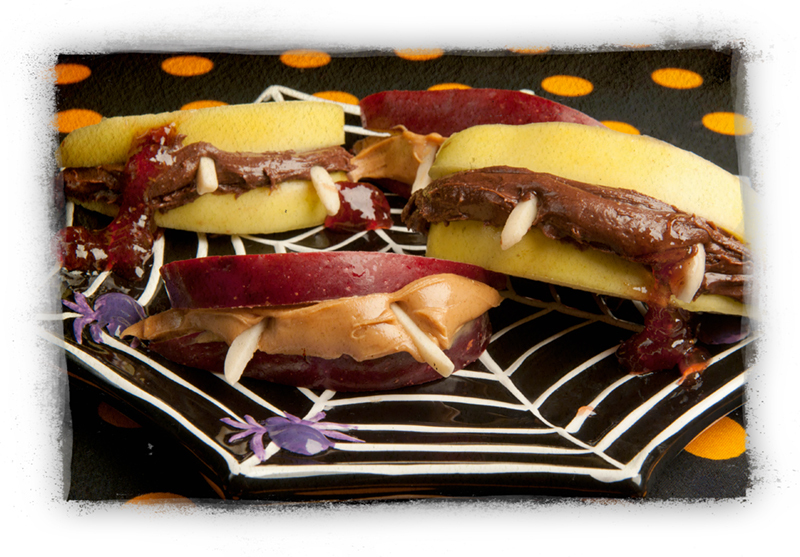 Try making these fun Vampire Apple Bites. With a small ingredient list, the apple “mouths” come together quickly using your favorite nut or seed butters, some jam “blood” and teeth made from almond silvers. Easy to adjust for any nut butter – peanut, almond, cashew, sunflower seed, soy nut or macadamia nut butters all work. Ahem… so does chocolate nut butter! The instructions for this fun, easy snack are cross-posted at Sister Eden’s blog. Won’t you drop in for a bite? Hee hee – I had to say it! So what happens tomorrow morning? It’s November 1st and you;ve got gobs and gobs of leftover cobweb. On our end, we actually save it and use it again, year after year. Yes, there are some leaves in there, but it’s fine to keep. Plus, you know that stuff will never, ever decompose. 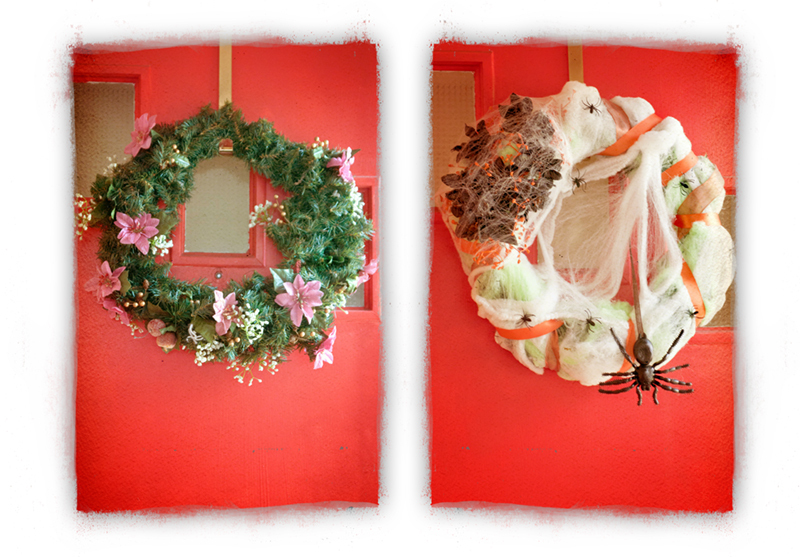 If you’re crafty, though, steal our idea and give an old wreath, like the tired Christmas wreath on the left a facelift. We used the same flowers, a little paint, hot glue and stray ribbon and decorations to upcycle a wreath and cobwebs into a fun new decoration. More details from this project are on the Sister Eden blog. Don’t have any old cobwebs, but you do have a bunch of broken skeletons pieces? We did, too. 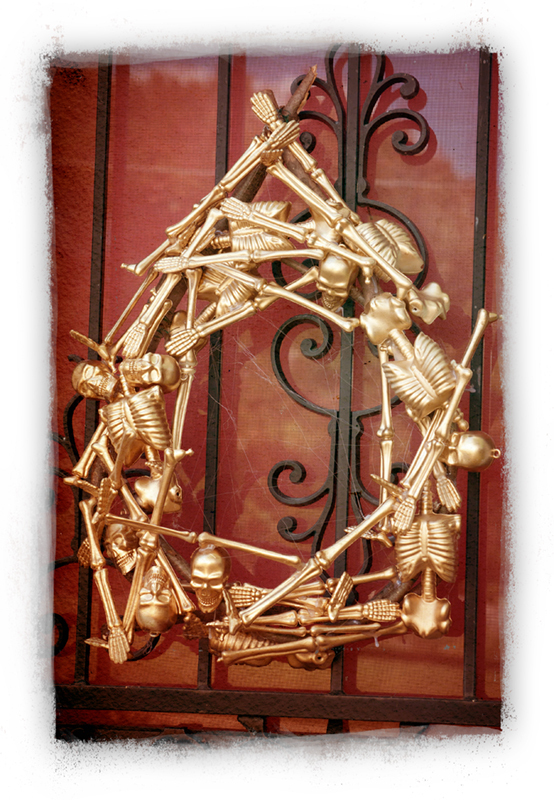 So we bent a few branches into a second wreath, painted the “parts” an updated gold color, and hot-glued the various skeleton limbs into a frightening new wreath. If you’re vegan or vegetarian, you’ve heard it a million times: Where do you get your protein? Now, in addition to the usual answer you have (rolling your eyes, for example!) you can add another item to the list: CHIPS! The good folks at ProTings have created a baked crisp (it’s a chip) with 15 grams of protein per serving. These crunchy snacks are vegan, gluten free and non-GMO. ProTings come in three flavors – chili lime, sea salt and tangy southern BBQ. We got to sample them all at the Natural Products Expo and each was tasty, but the chili lime won as our fave. ProTings power comes from pea protein, flaxseeds and sunflower seed oil. We are big fans of pea protein – it’s showing up all over the place lately and is a wonderful alternative for those with soy concerns. 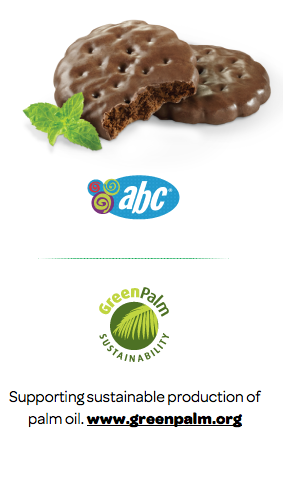 You can read more about the ProTings ingredients, which are all recognizable, on their website. 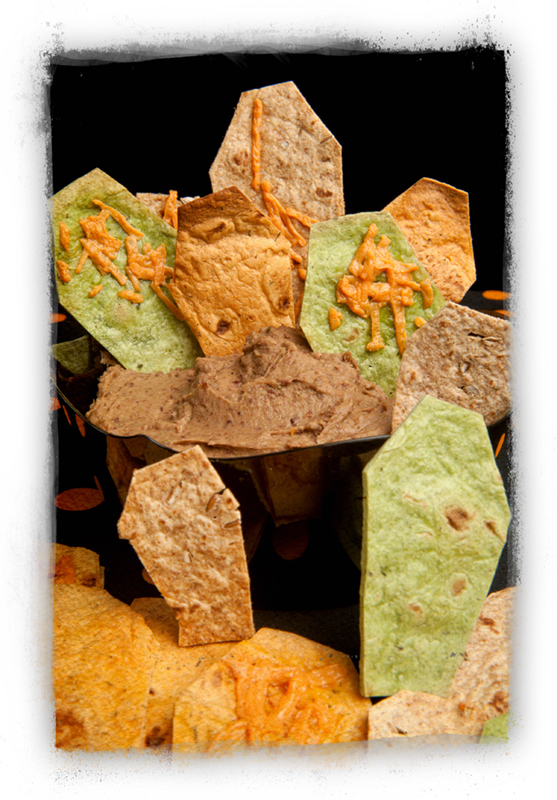 To find these yummy crisps and munch on them yourself, visit the locations page on ProTings website. The company is based in New York and most of their distribution is in that region so far. Peas. So hot right now. Who knew that the day would come for these modest legumes? But peas are fast becoming a big trend. 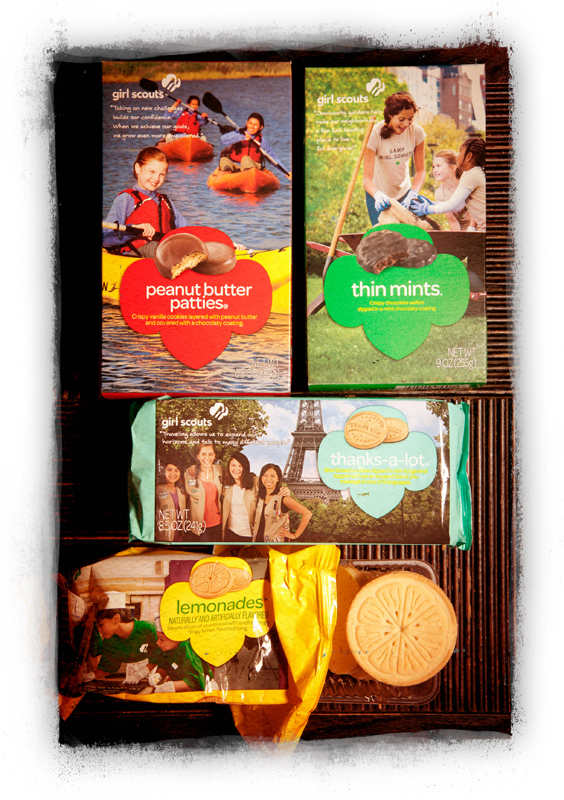 They’re non-GMO, gluten-free, high in protein, contain iron/fiber/calcium, and are low in fat. For vegans peas can be a great source of soy-free, nut-free protein. And if you have a garden, peas are easy to grow, too. 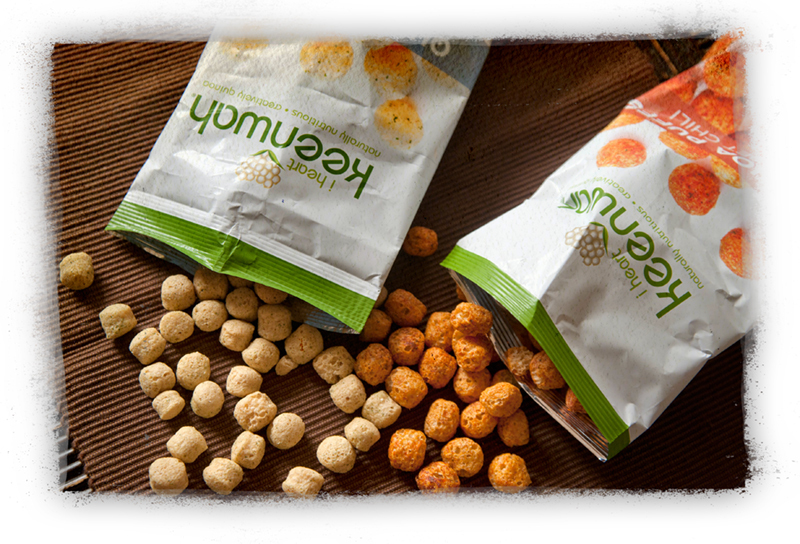 At the Natural Products Expo last fall, we bumped into a pea company and their delicous snack packs – Yumpeez. These little organic treats are made from yellow split-peas and boast 7 grams of protein per bag. Grown and made in Canada, the mother-company of Yumpeez is Best Cooking Pulses. They have been in the business of growing peas since 1936. That’s an impressive history. Best Cooking Pulses is a family-owned and their crops include/products green and yellow split peas, whole peas, chickpeas, lentils, pulse flours (pea, chickpea, lentil and bean), pea fiber, pea bran meal, and roasted split peas. All of their goods are gluten-free, kosher, halal, vegan/vegetarian, non-GMO and available certified organic. This company also believes in and practices sustainability policies for a greener future. Need some recipes with peas? They have that too! Yumpeez are roasted and seasoned peas. They have barbecue and dill pickle flavors. The little peas are crunchy and savory, with very little sugar and no MSG. This would be an ideal snack for kids’ lunches, picnics, camping, hikes, even to stash in your desk at the office. Currently, Yumpeez aren’t available in stores in the USA, only Canada. However, you can buy them on Amazon! A pack of 12 is about $20. 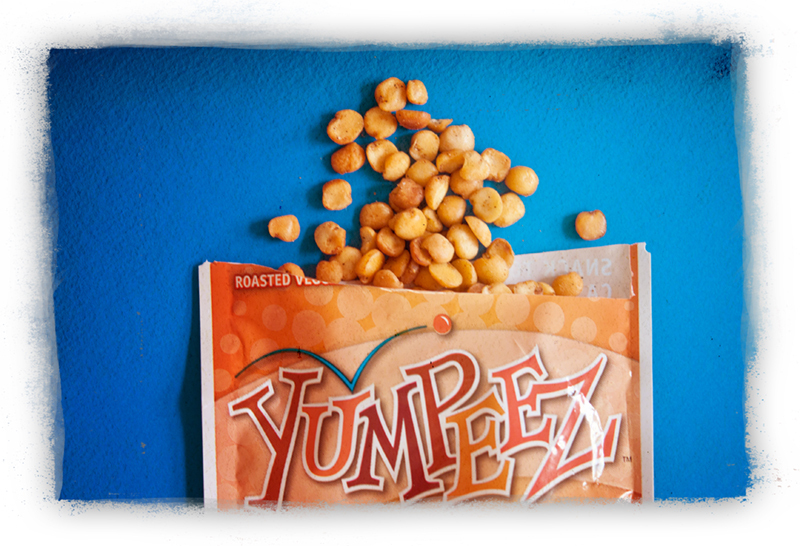 So go ahead, get yumpers over some Yumpeez. They’re delicious and good for you!